One of the first things a child tries to draw is a person. Perhaps you remember your first attempts; they probably consisted of a big, round head with stick legs and arms. As you grew, you were no longer satisfied with your first attempts to draw a person, and now you want to achieve something a bit more realistic. Optional: Colored pencils, markers, crayons, or other medium if you want to add color to your drawing. 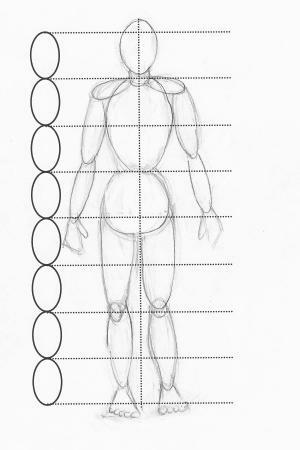 The hardest thing for most artists is achieving the right proportion among the various parts of the body. This is made even more difficult, because body proportion change drastically over our childhoods. If you learn a simple rule of thumb, you'll find it easier to create a relatively realistic human figure. A person's height can be broken down into head lengths. If you measure from the top of the head to the chin, an ideal adult figure is approximately eight heads in height, with variance typically from seven and one-half head lengths to eight head lengths. The image below uses eight head lengths to illustrate how this works. 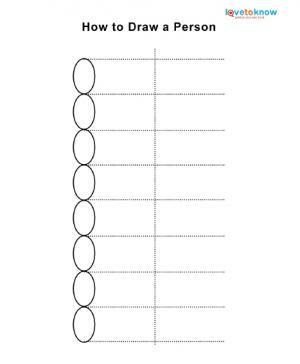 To help you practice this method, download and print out the practice sheet below. The sheet is in PDF format and can be opened with Adobe Reader. Drawing children presents an additional challenge, as the ratio of head length to the rest of the body and legs changes as a child grows. At one year of age, a child's body and legs are approximately three head lengths. Over time that ratio changes and at approximately ten years of age, a child's body and legs are six head lengths. Male and female figures are proportioned differently. Typically, a male figure is taller with broad shoulders and chest, a less pronounced waistline, and narrow hips. 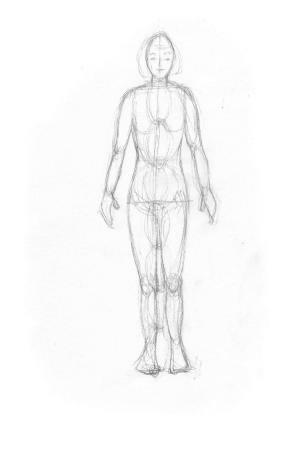 Male bodies tend to be more angular than those of women. A female figure has narrower shoulders and chest with broader hips and thighs than those of men. In addition her waistline is usually more pronounced than a man's waistline. These instructions are suitable for pre-teens through adults. Younger elementary school-age children may also be able to complete the drawing with some help from an adult. 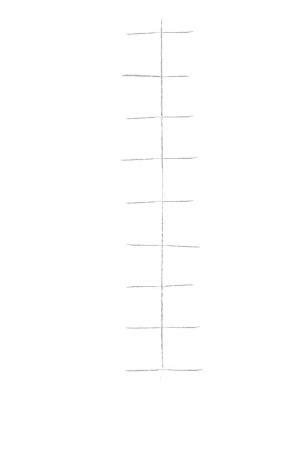 Draw your proportion lines lightly in pencil. 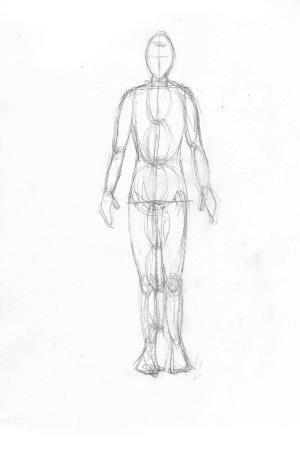 Start drawing the figure by roughing in shapes for the body, head, neck, arms, and legs. 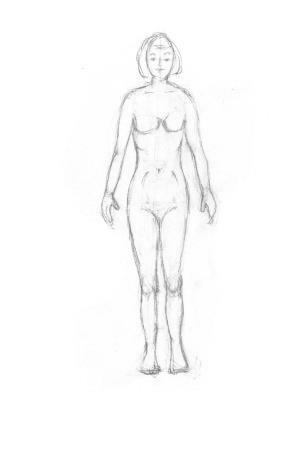 If you are drawing a female, make sure shoulders are relatively narrow and the hips relatively wide. A female's neck is usually narrower than a man's neck. 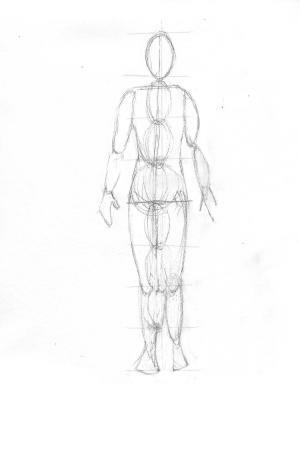 Refine the shapes of the arms, legs, hands, and feet. Draw the shapes of the facial features. Draw the shapes of the hands and feet. Add shape to the arms and legs, as well as the torso. Define muscles to a male figure. 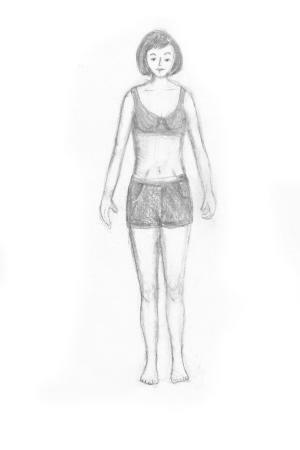 Add breasts and rounded shapes to a female torso. Add shading to give your figure a three-dimensional look. Remove construction lines and refine shading with your finger or a cotton swab. Be careful not to smear your drawing while your hands are dirty. You can finish by adding color to your drawing if you wish to do so. To practice your figure drawing skills, use your friends and family as live models. You can also use your own photos or photos from magazines or the Internet as sources for your drawings. If you are having trouble with proportion, draw in shapes on top of a photo or image you have printed or copied. Practice drawing faces as well to achieve an even more realistic piece of artwork.